Coach Brett Rosen began coaching at the Rising Star Baseball Camp in 2008. 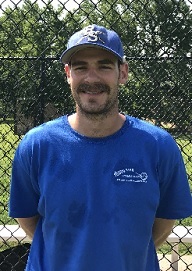 After attrending the camp for six consecutive years and being recognized as a top catcher in the area, Coach Rosen played NCAA Baseball at Muhlenberg College.In summer 2011, Coach Rosen earned a spot on the European National Team competing and winning the qualifying round championship in Tel-Aviv, Israel. In 2012, Coach Rosen competed in Holland and represented Great Britain in the European National Championship. In 2015, Rosen signed a contract to play professionally with the Hamburg Stealers (Germany) in the European Professional League where he starred at catcher for two years. In the fall of 2016, Coach Rosen competed in the World Baseball Classic (WBC) as a catcher for Team Great Britain. At camp, Coach Rosen specializes in catching drills and teaching hitting. When off the baseball diamond, he enjoys travel, working out, and attending the Olympics.